Do you know our honorable Prime Minister Narendra Modi has announced the new pension scheme recently? What are the eligibility criteria for it? Do you know the benefits of it? Well, all these information is included in this article. Let’s have a look at it. What is One Rank One Pension Yojana? 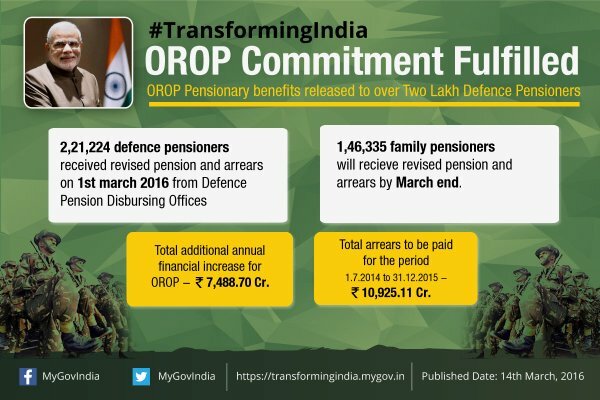 Update :- On 14th March, 2016, Government of india has released benefits to OROP pensioner to nearly two lakh defence pensioners. Total of 2,21,224 defence pensioners gets OROP pension in their bank accounts. 1,46,335 family pensioners will also receive revised pension and arrears by March End. Total Additional annual financial increase for OROP Rs.7,488.70cr and Total Arrears to be paid for the period 2014-15 s Rs.10,925.11 cr. Update :- On 7th September, 2015, Government of india finally allocated and implemented One Rank One Pension (which has total budget of 8500cr), All the ex-serviceman will get benefit :). Update :- From last 60 days Army veteran are on hunger strike at Jantar Mantar (Delhi). Total cost of One Rank One Pension is Rs.8500 cr.In last 10 years, congress allocated just Rs.500cr for OROP, in 1st year Narendra Modi Government allocated Rs.1000cr. Hope on 15th August, Prime minister announce implementation of OROP. The One Rank One Pension Scheme was announced by Narendra Modi at the rally in Mathura on 25th May,2015. This scheme is for the retired personnel of the armed forces. The One Rank One Pension scheme is announced to provide pension with the amount of about Rs 8300 crore for around 25 Lakh ex-servicemen. This was the demand of Indian Military Personnel since long time. 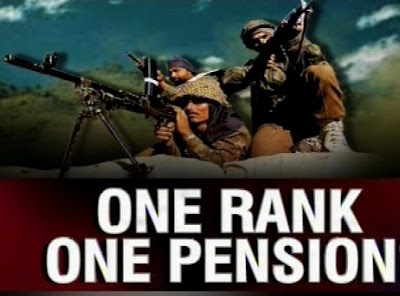 This pension scheme means armed forces personnel who hold the same rank will acquire the same pension despite of the last drawn pay, years of service and the years served in the particular rank. Government of India has launched Atal Pension Yojana for common man of india where you get pension from Rs.1000 to Rs.5000/-. 1. If the person is retires in 1991, than he must be paid the same pension at the time of retirement, as the one who retires in another year. 2. In this scheme, the employee of the same rank and same period of service irrespective of his date of retirement will get the same pension. 3. he date of retirement determines the amount of pension of the particular employee. The union cabinet permitted the pensions of the JCOs/ORs who retired before January 1996 and those who superannuated after the year 1996. Many of the ex-servicemen was holding rallies and returning their medals as a sign of protest for the last four years to get the pension. Their wish has come true now! Now, the retired armed forced employees will get the good amount of pension according to their date of retirement. Want to know more about it? To get updated about the One Rank One Pension scheme, keep visiting us. We will update more about it as soon as the latest news is available. Update :- On 31st May,2015 Prime Minister Narendra Modi said that their government is all committed to implement One Rank One Pension Scheme in Mann Ki Baat Program (addressing nation via radio). He also advised ex-serviceman to not get influenced from opposition political parties. "It is bit complicated issue, but we will solve it for sure, soon. ", said Narendra Modi. Update :- On 15th June, 2015, Ex-Service Man and Retired Defence Personnel goes on hunger strike. They demand to implement "One Rank One Pension" policy As soon as possible. And Defence Minister Manohar Parrikar has assured them the "promises" made would be kept and that they should be "patient". Update :- 9th July, 2015, Defence Minister Manohar Parikar said that there will be 'good news' on One Rank One Pension Issue Very Soon. " All formalities from Defence ministry has been completed or about to complete. Since there are many ministry has been involved to implement OROP, things will be fine soon. - Source. How much OROP will cost to Government? The system of OROP will benefit 25 lakh ex-servicemen, and is expected to cost the government around Rs 8,500 crore. Moreover, if you have any questions regarding what is One Rank One Pension scheme than leave comment below in comment box.